What is Dyslexia ? Dyslexia is the most common learning disability. Individuals with this condition have difficulty in the areas of language processing which include spelling words, reading quickly, writing words. sounding out words in the head, pronouncing words when reading aloud and understanding what one reads. 1 in 5 peoples are suffering from with Dyslexia in Malaysia and about 70 to 85% of children who are placed in special education for learning disabilities are dyslexic. 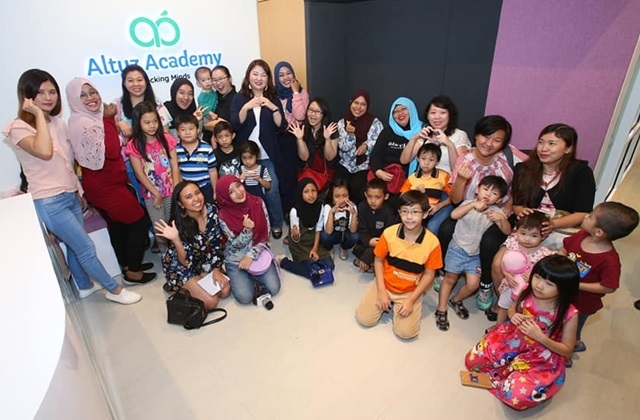 To understand more on the Orton-Gillingham ("OG") Approach, Mommy Jane and Little Angels had attended the Altuz Academy's Open Day last weekend. The lack of expert instruction and proper intervention to rectify the ready problems of dyslexic children before they fall behind in traditional schooling can lead to irreparable harm, low self-esteem and a widening gap that becomes increasingly difficult to close. This has negative societal implications and we, as parents need to ensure that our dyslexic children are able to read proficiently to ensure their quality of life. The opening of Altuz Academy, a premier education centre for dyslexia intervention is a remedy for all parents who had children with dyslexia. Using the OG Approach, it is a highly structured evidence-based approach to teach reading. It is also recognised by the International Dyslexia Association ("IDA"). The OG approach was developed in the 1920s by Dr Samuel Orton, a doctor who first discovered dyslexia together with Anna Gillingham, a gifted teacher and psychologist. This approach has been further supported by over 100,000 scientific studies over the period of 70 years conclusively showed that a reading approach should include 5 important pillars i.e. phonemic, awareness, systematic phonics, fluency, vocabulary and comprehension. The OG approach uses all the learning pathways i.e. seeing, hearing, feeling and awareness of motion to be brought together by the thinking brain. The instructor engages in multisensory teaching to convey curricular content in the most understandable way to the student. Step by step learners move from the simple, well-learned material to that which is more and more complex as they master each level of language skills. Each lesson was carefully builds upon the previous lesson. This includes constant and consistent review of previous taught concepts. The approach is most often associated with a one-on-one teacher-student instructional model or just a small group of students. It provides for a close teacher-student relationship that builds self-confidence based on success. The unique needs of each student are met. The English is simplified by teaching letters and letter combinations known as phonograms. The students are taught exactly what they need to know in a clear and straightforward fashion. The OG approach had benefited students of all ages and abilities so that learning had became a rewarding experience. 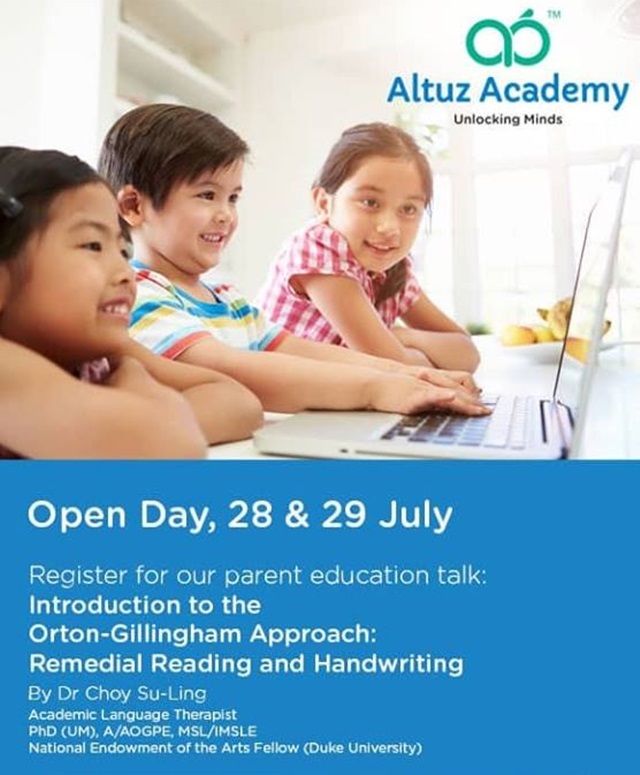 Dr. Choy Su-Ling, the founder of Altuz Academy said that it is critically important that remedial specialists, educators and teachers working with dyslexic students be vetted, highly trained in an evidence-based approach with oversight and accountability. Literacy training should be comprehensive, accredited by an international organisation and include a supervised practicum period. There should also be ongoing professional development for the sake of the children whom they work with. All Academic Language Therapists at Altuz Academy had received the vigorous training and were supervised practicum accredited by the Academy of Orton-Gillingham Practitioners and Educators ("AOGPE") and IDA. Mommy Jane believes that early intervention is vital for a child to learn to deal with their learning disability so that they too able to have the opportunity to lead a productive and fulfilling life like Einstein, Edison and Da Vinci. With the powerful instructional approach in the hands of skilled instructors, the OG approach will benefits students of all ages and abilities so that learning will becomes a rewarding experience to all the Children with Dyslexia. A good approach for children with Dyslexia. Will recommend this academy to my friends who are looking for such academy for their children. Thanks James for the recommendation. I heard about this approach too when I google to find a solution for my kids who had dyslexia. Some centre do offer it too. It is a great approach for kids with Dyslexia for them to live like any other normal children and learn with them. Bagusnya akademi ni. Sesuai untuk anak-anak yang ada disleksia. Cara macam ni sangat mudah untuk anak-anak kenal huruf dan membaca. Mek Onie, betul. They have the approach taught by their qualified tutors to ensure the children with dyslexia able to cope with their learning process. It is a good medium academy for them, during this circumstance we more focus to them by individual weakness and advantages. Thus more practical and effective. Congrats. Khairul, agreed with you. 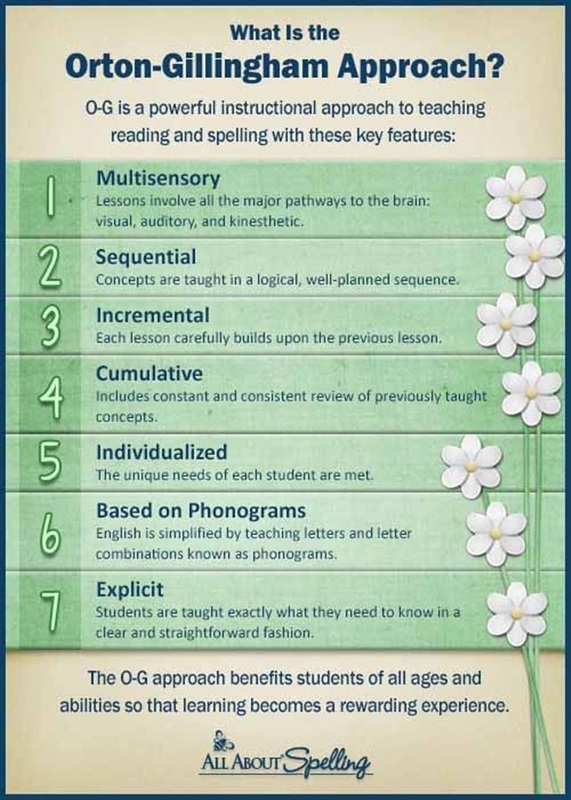 This approach will helps lots of children with dyslexia to learn. Iffah, thank you. They have 1 to 1 session too to cater different kids' needs. banyak perkara yang kita dapat fahami dan belajat ttg dileksia di sini...bagus untuk mereka yang ada anak2 dileksia untuk dihantar di sini sebab prog dia mmg telah diiktiraf di peringkat antarabangsa. Ayu, betul and the tutors are qualified to teach and will helps all these kids to learn well. Fadzi, agreed with you so that most parents will aware if their children had Dyslexia. Sgt bagus usaha ni. Ohsem. Usaha yg murni. Anak2 ni perlukan tunjuk ajar yg betul dan sesuai. Barulah dpt menyerlahkan kecerdikan mereka. If tidak diberikan begini, sukar mereka nak berkembang & bersaing dgn anak yg normal. Aida, betul. The soonest the children with dyslexia start this program, the better they will adapt to it. Bagus ada akademi disleksia ni untuk memberi kesedaran kepada rakyat Malaysia mengenai penyakit ini dan cara mengatasinya. To give parents more choices to send their kids to a better academy. Zharif, it is totally different and I'm sure kids with Dyslexia would love to come here to help them in their learning process. So that more parents will aware of dyslexia and take early precaution to help their kids. Mama Hakim, betul. Children with Dyslexia could lead a normal like and will have a great future if they learn how to handle their situation well. Mazni, betul. The early they start, they sure able to control their mind.